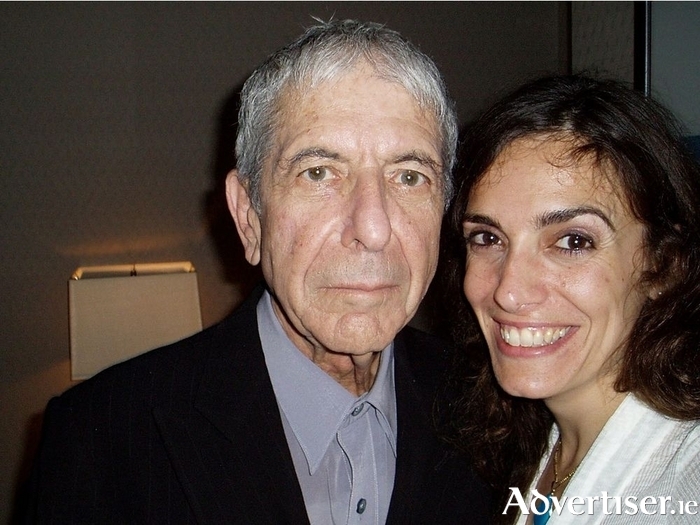 Singer-songwriter NEeMA with the late, great, Leonard Cohen. SHE SPENT time with the Dalai Lama and Mother Teresa, worked with street children in Egypt, and with Tribal Elders of Wekweti, an isolated First Nation community in northern Canada, but she is best known as the late Leonard Cohen's protege. Canadian folk-pop singer-songwriter NEeMA plays The Loft at Seven on Thursday April 13, as part of her current Irish and British tour. She has recorded three albums - Painting My Wall Gold (2016 ), which featured Emmylou Harris; Watching You Think (2010 ), produced by Leonard Cohen collaborator Pierre Marchand, and featuring an album cover designed by Cohen himself; and Masì Cho (2006 ). She has also toured with Jeff Beck, Joe Cocker, Cyndi Lauper, and Elton John. Born in Montreal of Egyptian and Lebanese decent, her first encounter with Leonard Cohen was both mundane and surprising. She already had ambitions to be a musician when, walking down St-Laurent Blvd, in 2006, looking at the ground while talking on her mobile, she literally bumped into the iconic poet and musician. However, that chance meeting led to an informal musical mentorship, that resulted in Cohen co-producing Watching You Think. He was watching out for the singer during some hard times as well, as when NEeMA's sister died in 2009. “Once, we were on video chat and he said, ‘Let’s dance.’ And he started dancing in front of the video screen — this 70-something-year-old man. He always knew the right thing to say. Poetry wasn’t just in his work, it was in his life." For more information and tickets go to sevenbridgestreet.ie or call 091 - 563804.